Pamukkale, meaning "cotton castle" in Turkish, isa natural site in Denizli Province in south western Turkey. The city contains hot springs and travertines, terraces of carbonate minerals left by the flowing water. It is located in Turkey's Inner Aegean region, in the River Menderes valley, which has a temperate climate for most of the year. The ancient Greco-Roman and Byzantine city of Hierapolis was built on top of the white "castle" which is in total about 2,700 metres (8,860 ft) long, 600 m(1,970 ft) wide and 160 m (525 ft) high. It can be seen from the hills on the opposite side of the valley in the town of Denizli, 20 km away. We will pick-up you from your Hotel between at 07:30 - 08:30 o'clock and first on the way give a break 15 minutes. Then we arrive to Pamukkale and eat lunch at the restaurant. After the lunch we are going to visit Hierapolis Ancient City,Travertines. After the tour we leave from Pamukkale and back to hotels. 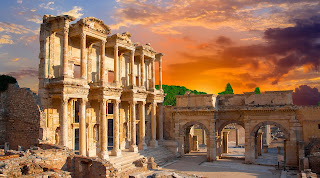 If you are traveler, you must see Ephesus Antique City. Tur programı: Adaland Aquapark bünyesinde hizmet veren Adaland Yunus Parkı,günde bir kez saat 14:00-15:00 saatleri arasında yaklaşık bir saatlik yunus şovları ve diğer deniz memelileri ile birlikte size muhteşem gösteriler sunmaktadır.Ayrıca şov sonrasında yunuslarla yüzmek isteyenler extra ücret ödeyip ,bu fırsatı ele edebilirler. 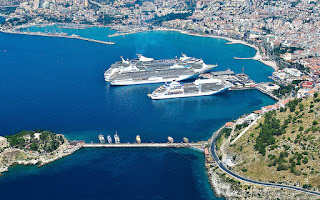 ·0-3yaş arası çocuklar ücretsiz ,4-9 yaş arası çocuklar %30 indirimlidir.